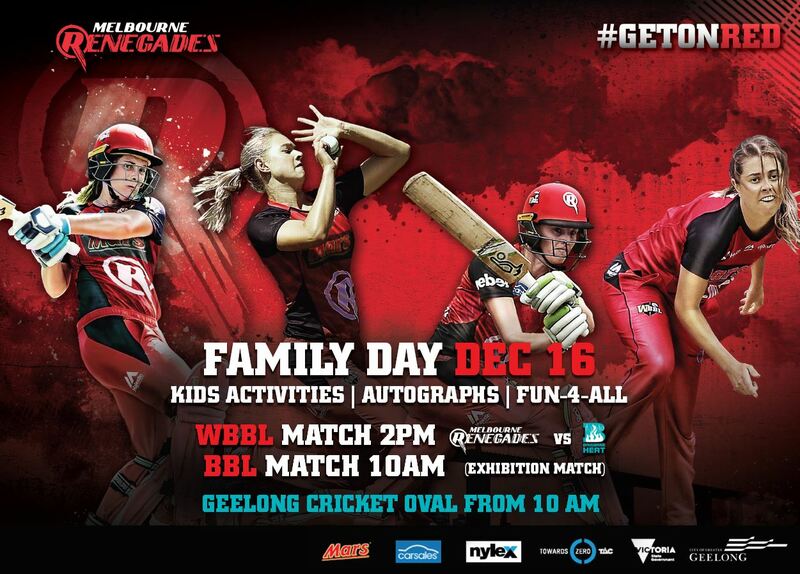 The Renegades will return to Geelong on December 16 to hold their annual Family Day at Geelong Cricket Ground. Bring the family down to watch the Renegades in action, and keep the children entertained with plenty of family fun around the pitch. Festivities officially kick off at 10:00am with loads of top tier cricket, giveaways, food, and fun for the entire family throughout the day. Get up close and personal with your favourite Renegades BBL and WBBL team members. The ‘Active Area’ will feature Nickelodeon courses including Paw Patrol and Teenage Mutant Ninja turtles, face painting, music, an interactive cricket skills zone for kids, lots of player signing opportunities and plenty of giveaways. The Renegades membership team will also be there, so make sure to ask about this year’s new Geelong specific memberships. The Melbourne Renegades will kick off their BBL Intra Club Practice match at 10:00am, but the main event this year is the Melbourne Renegades WBBL team playing for Competition points against Brisbane Heat at 2:00pm so make sure you get down and watch the girls in action!